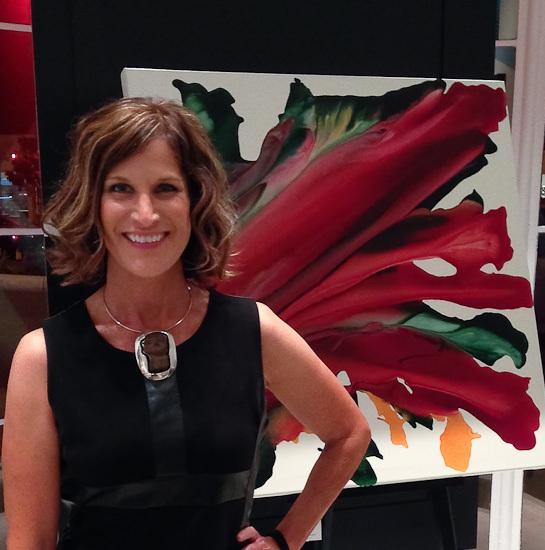 Art Bra Austin newcomer Cindy Lopez uses acrylic and mixed media when creating her abstract and contemporary art pieces. In addition to privately commissioned work, Cindy’s contemporary acrylic and mixed media artwork has been displayed and sold at a variety of public venues and galleries in Texas and LA. A few years have passed since Cindy first heard of Art Bra Austin from another artist. As fate would have it, she was approached by The Piazza Center to create an art bra on their behalf for the 2015 show. And to the good fortune of The Piazza Center and BCRC, she said yes. As a first-time Art Bra Austin Artist, Cindy was inspired to create a bra that was strong and fierce to represent those diagnosed with breast cancer. She herself has had many people in her life diagnosed, from her grandmother to 8 of her friends, and is honored to use her talents to raise funds to provide women and men with the resources they need as they battle breast cancer. View more of Cindy’s work at cindylopezart.com. 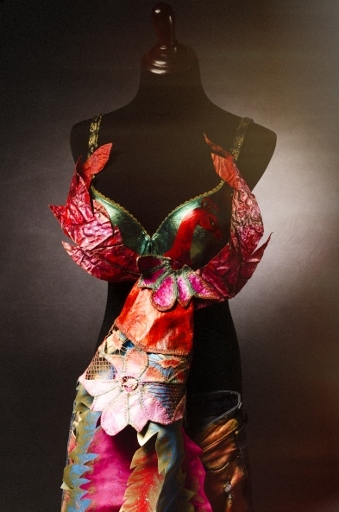 Created to honor three of her dear friends who are battling breast cancer (Robin Perras —Cindy’s model — Natalie Mahany and Jennifer Huff), this dramatic bra is comprised of acrylic, gold leaf, spray paint, fabric, and raw canvas. Cindy painstakingly applied gold leaf to the cups of the bra as well as to the canvas fabric, then added pattern and texture using stencils and spray paint. She used the same process on the fabric for the tail feathers, and sewed everything together by hand. The bra comes with a pair of painted jeans to complete the outfit, which Cindy hopes represents battling through and overcoming breast cancer. More examples of Cindy’s stunning art can be seen below. All art bras will be auctioned off at BCRC’s signature charity event to raise funds to support local women affected by breast cancer. To learn more about Art Bra Austin, visit www.artbraaustin.org.